Rainbow bagels and “unicorn” drinks have taken the food industry by storm. Unfortunately, these snacks only look out of this world because they are — each treat is loaded with artificial flavors and colors. But you can add whimsy to your own healthy snacks and party foods by blending colorful, powdered algae, berries and other good-for-you powdered antioxidants into dairy or vegan bases. In this way, you’ll be adding immunity-boosting antioxidants to your diet, while enjoying a delicious alternative to those nature-defying, pricey treats that look so tempting at those gourmet national chains! You’ll find freeze-dried berries at the nearest healthy foods market, or online.Mashing a heaping spoonful of your favorite berries in a plastic bag produces the perfect amount of colorful powder. Use freeze-dried blueberries for purple shade, goji berries for orange, and strawberries for a pale-pink. Into savory “rainbows”? Your own dehydrator makes it possible to create a wealth of colorful powders from vegetables. From tomatoes and kale to yellow squash and carrots, simply pulsing dehydrated veggies in your food processor will yield the same kind of vegetable powders you’ll find in upscale markets. If making powdered fruits and vegetables is too time consuming, you can also buy both common and exotic types pre-made. They may cost a bit more, but you only use a bit at a time. In addition, you’ll find more off the beaten track colors and flavors. Options range from powdered turmeric for yellow, to powdered matcha and spirulina for various blue and green shades. Ready for your superfun, superfood treats? To make colorful toast spreads, blend individual spoonfuls of colorful antioxidant powders into separate small bowls, in which you’ve scooped a bit of cream cheese, or vegan cashew spread. 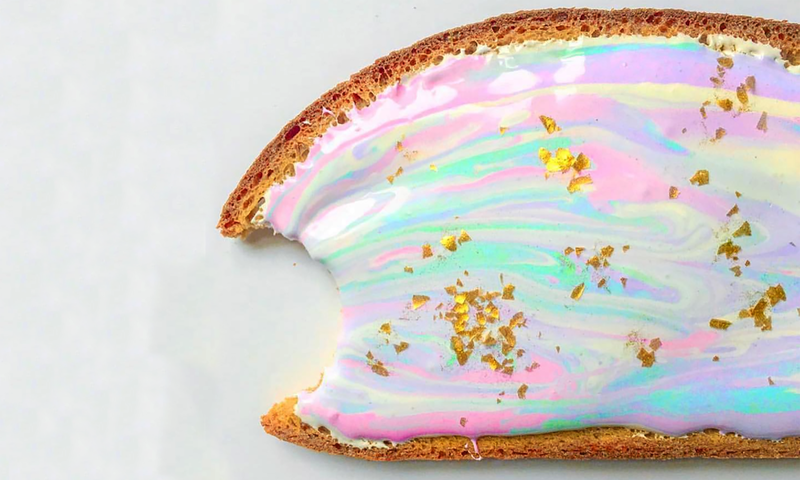 Artfully smear the different spreads on a single piece of toast in colorful patterns, then repeat with the rest of your toast. To really wow the brunch crowd, make a large base of your favorite white smoothie concoction (frozen bananas, almond milk and vanilla yogurt is a classic.) Divide it into separate pourable cups. Mix a separate antioxidant powder into each cup, then pour the colorful mixes, in layers, into glasses for your guests. You can even create a swirled effect by carefully easing a fork down the sides of the glasses. Header photo by studiomucci on Instagram.